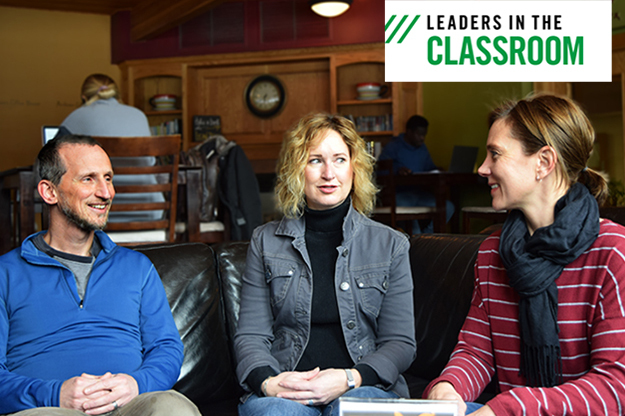 English professor Adam Kitzes (left) and sociology professor Daphne Pedersen (right) spent months preparing for teaching a semester at the American College of Norway, a process that Tami Carmichael, ACN coordinator and English professor at UND, guided them through. Photo by Dima Williams/UND Today. In early November, Adam Kitzes and Daphne Pedersen received good news – their visas along with those of their four children had been approved. 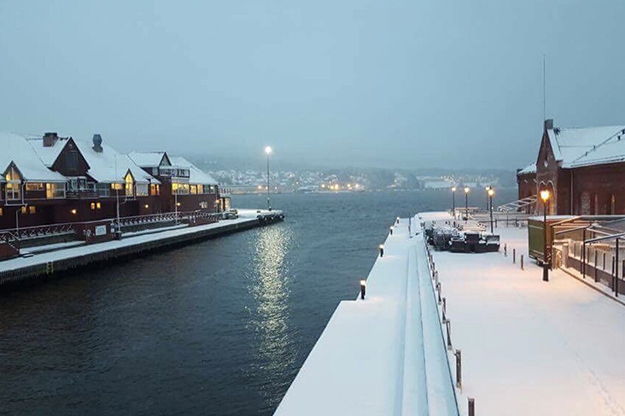 Months of preparation finally drew to the certitude that, in December, the two UND professors are journeying to Moss, Norway. There, they are teaching at the American College of Norway (ACN) in the upcoming spring semester. Kitzes and Pedersen form the latest faculty cohort to go to ACN, a one-year higher-education institution and long-time UND partner in study- and teach-abroad initiatives. 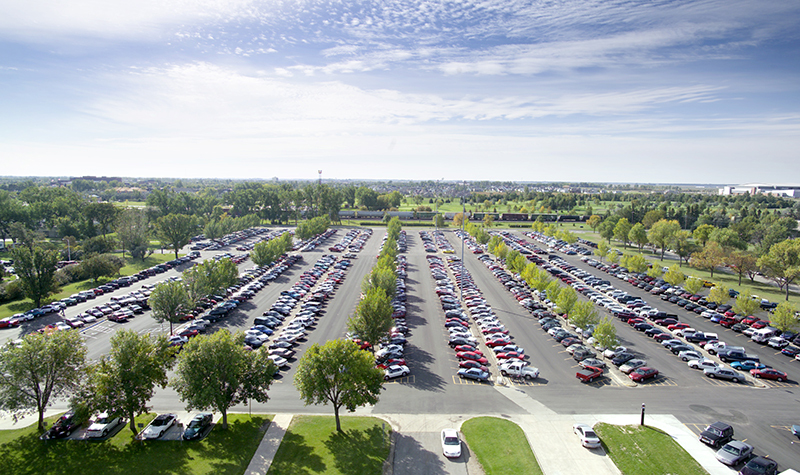 UND and ACN’s collaboration dates back to the late 1980s, when the founder of the latter, Norwegian entrepreneur Steinaer Opstad, met with then UND President Tom Clifford. Opstad strove to establish a college that would help Norwegian students transfer to U.S. universities and, at the same time, welcome U.S. students for a term or two overseas. “It was really a genius idea,” said Tami Carmichael, English professor and ACN coordinator at UND. Clifford shared that sentiment, which led to the University becoming ACN’s first international partner – a relationship that has lasted over 25 years. “ACN is a fantastic opportunity for students to explore the world and for faculty to teach abroad and engage in research opportunities,” said UND Senior Vice Provost Debbie Storrs. Carmichael has herself taught at ACN – more times than she could say with certainty. Almost two decades ago, she began to actively recruit and help UND students and faculty experience ACN. “It is a really rich and complex relationship and partnership,” said Carmichael, adding that her insight of the “nuts and bolts” of it provide academic continuity, oversight as well as assistance to faculty. 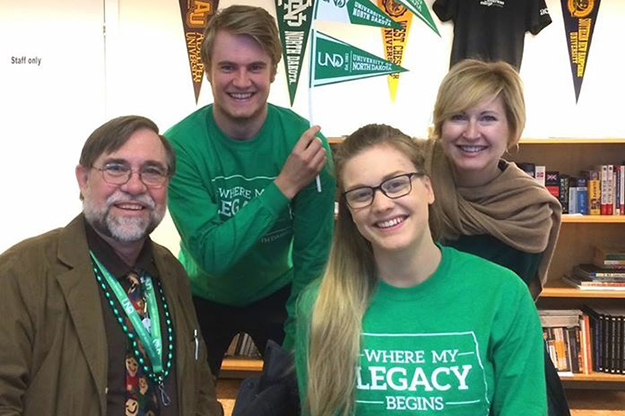 UND’s partnership with the American College of Norway goes back over 25 years ago, when then President Tom Clifford embraced the possibility for international collaboration. Photo courtesy of Tami Carmichael. For Kitzes and Pedersen, a sociology professor, the cogs began to churn when their disciplines matched what ACN sought. As a cornerstone for Norwegian youth eyeing U.S. universities, the college boasts a general-education, American-style curriculum, upheld by three permanent ACN educators and guests from the U.S. For next semester, ACN needed someone to teach English and sociology. After submitting their applications to Carmichael and spending numerous hours in preparatory discussions with her, Kitzes and Pedersen have honed the classes they are to offer to the 80 or so ACN students. “We are both going to be doing slightly different teaching than we do here on campus,” said Pedersen. For starters, both of them are to be leading courses novel to them. These include an introduction to film for Kitzes and a class on social change and movements for Pedersen. At the same time, there will be many fewer faces in their ACN classrooms than at UND. “That is exciting in terms of developing courses because it means there can be much more interaction and we can have students do more together,” Pedersen said. The thrill, nonetheless, mixes with a number of important considerations. Although Norwegians are often well versed in English, it may be their second or even third language. This prompts questions about what type of instruction and assignments fit their needs and abilities, said Carmichael, who helps faculty arrive at solutions. Then, there is the issue with resources – can American textbooks be ordered and will they even arrive on time; what devices are available to students; what online materials are accessible in Norway. The list goes on and on. But, it doesn’t faze Kitzes. Teaching at ACN is only half of the deal for UND faculty. Learning is the other. “Part of what we are there to do is to be students of Norway too,” said Pedersen. This begins with an immersion in the local culture. Kitzes, Pedersen and their children – two of whom are high-schoolers, are to live on the ACN campus together with other professors as well as students. Travel is not only encouraged; it is almost mandated. School weeks cease on Thursdays, leaving long weekends for jaunts to the capital of Oslo, which lies an hour north of Moss, and for trips to Norway’s neighbors. The town of Moss, where the American College of Norway is located, is a tight-knit community on a beautiful fjord. Photo courtesy of Tami Carmichael. Carmichael is to head one such excursion in April, when she is taking a group of students to Dublin to explore the Norwegian Viking heritage of the region. Kitzes and Pedersen are planning their own family escape to Ireland too. They may also engage in some research wanders (ACN affords easy access to European archives and conferences), but both are, for now, keeping an open mind about it. And, what is in front of Kitzes and Pedersen is not merely a chance to teach – and learn – abroad. It is the prospect to delve into and build on the relationships between two higher-education institutions as well as between two regions. 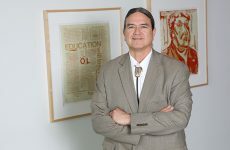 North Dakota vaunts a strong Norwegian ancestry, Carmichael said, which spills to the UND campus and nurtures the economic and educational ties between the state and the Scandinavian nation. It also props the University’s mission of meaningful engagement. “That kind of collaboration at the global level I think is very important for any of the strategic goals that UND is trying to accomplish,” Carmichael said.